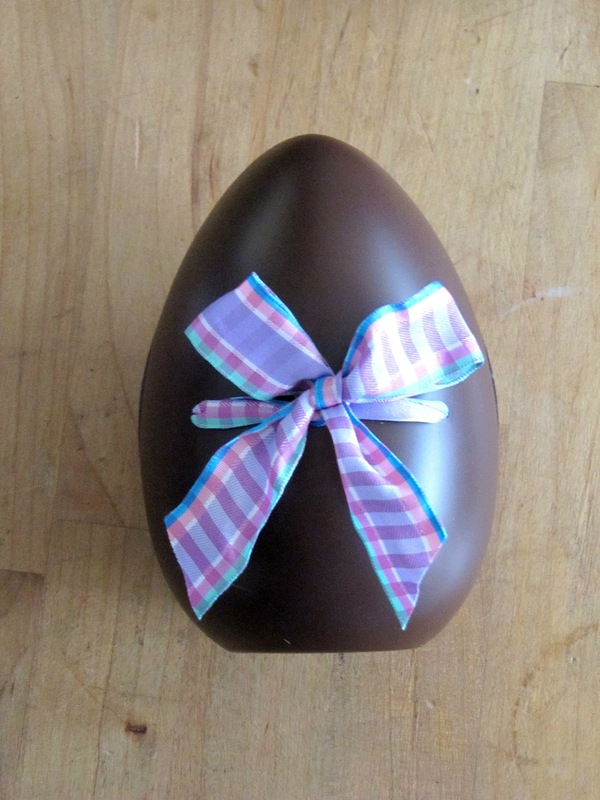 Doesn't this egg look good enough to eat? Yummy chocolate? Nope...painted plastic Easter egg! 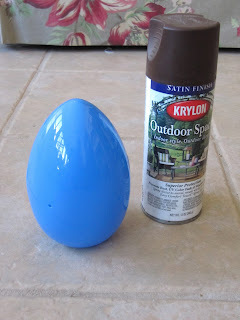 A jumbo plastic Easter egg from Walmart and my favorite paint...Krylon really sprays on nicely and looks great. 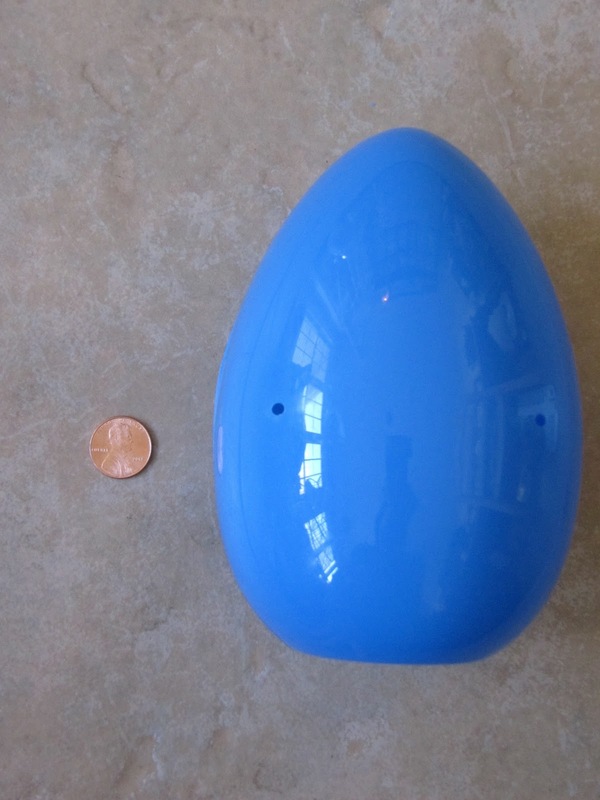 It's a big egg...great for decorating. 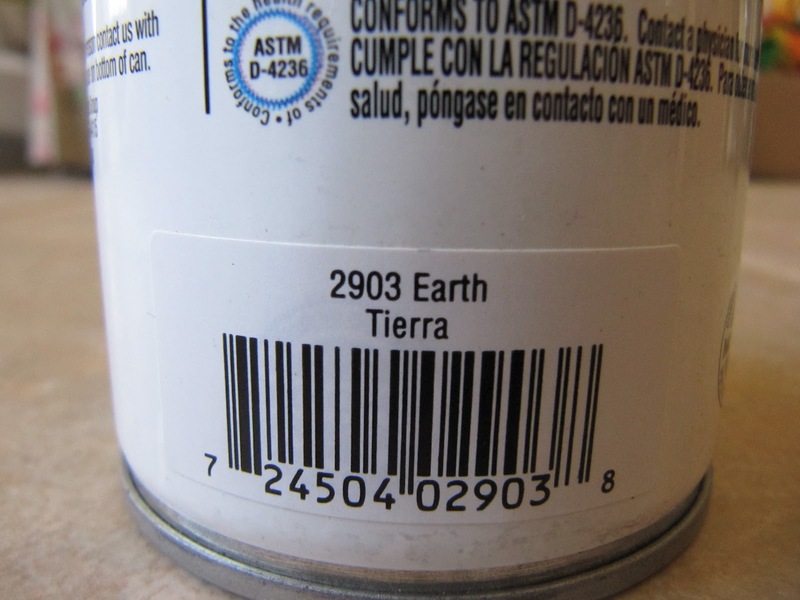 Here's the paint name. I've posted this color before for a bunny I painted. It's a satin finish. OMG...it looks like it was just dipped in a chocolate fondue!! 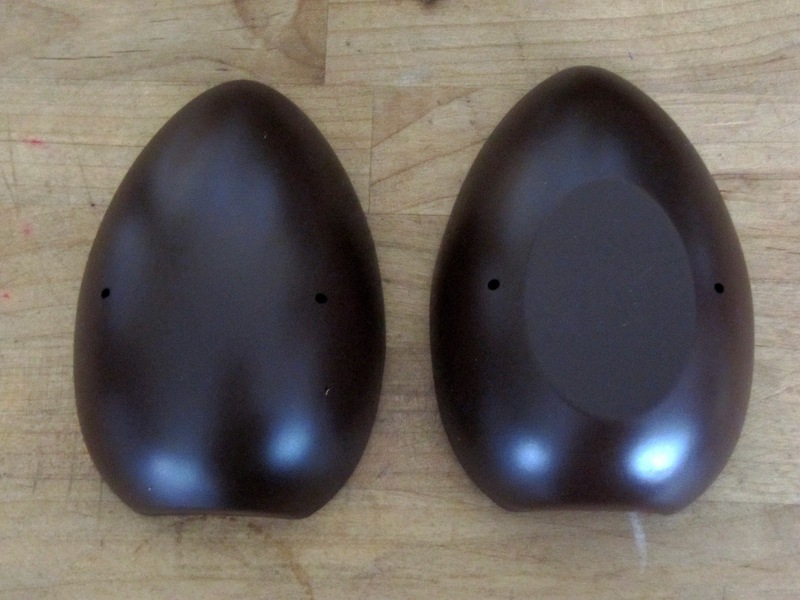 These 2 part eggs are great for putting little gifties or treats in. Here's the bunny I painted last year. Click HERE to see that post. They both make a cute arrangement. I realized the egg has little holes on the front and back. Not sure why, but I took advantage of the situation. Thread the wired edge ribbon through the holes. and tie into a cute little bow. Now the arrangement is all decked out for the holiday. 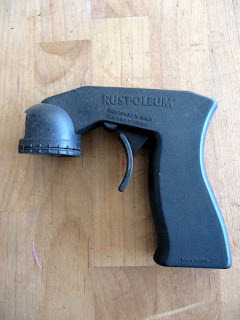 Here's the tool I was talking about. 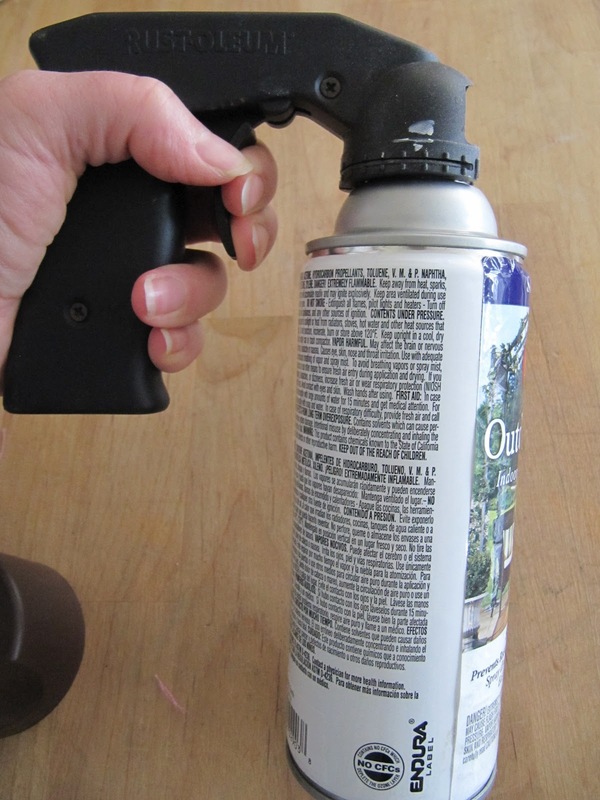 It's a spray can nozzle with a trigger. Slides over the top of the can. When you pull the trigger, the mechanism inside pushes the spray button. Really saves your fingers and no messy paint on them either. Have fun painting your eggs. Just make sure you tell people it's not real or they may take a bite out of it!! 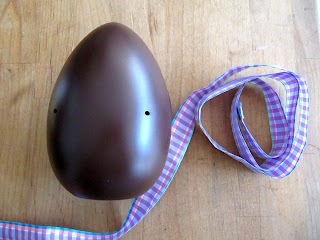 This would be great to paint all the little plastic eggs too and display them in a pretty bowl or Easter basket. Great idea! 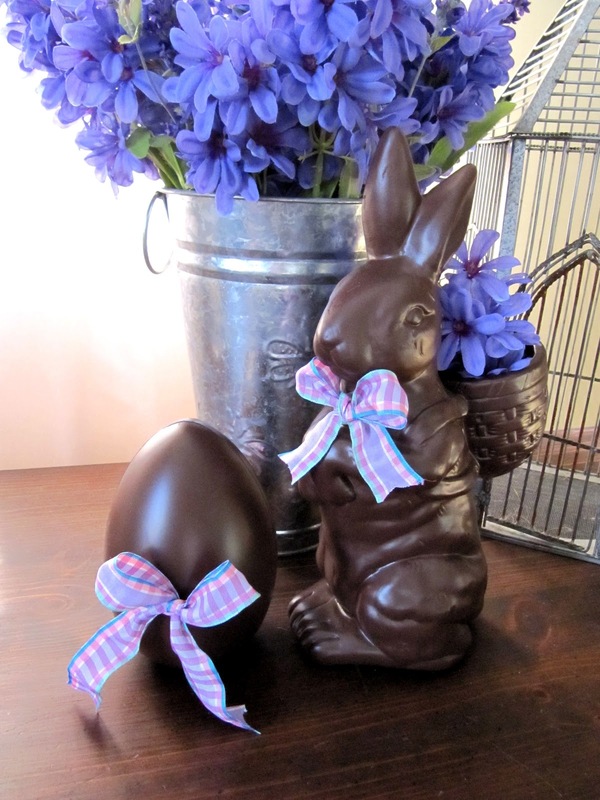 The bunny & egg really do look real! Oh no, I'm hungry for chocolate now.....lol! What a cute idea Karen, thanks for sharing. I can imagine one little boy picking the egg or bunny and seriously thinking they are chocolate! 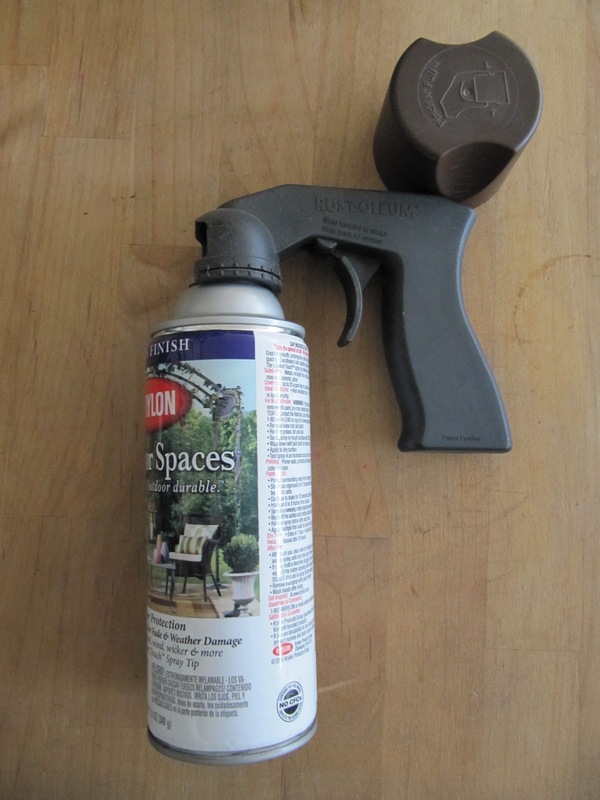 I bought one of those spray can trigger thingies and it was some of the best money I ever spent! No more aching index finger and no more ruined manicure! What a great idea. I do an Easter egg hunt every year for my son who in now 19. I bet he would think I am the coolest mom ever if I painted and decorated them to his liking instead of you ordinary pastel colors. I love them both, but I have to say the bunny is my favorite. What a great idea! Love them! They look like they would melt in the sunshine. I wrote down the color for future crafts. Thank you. 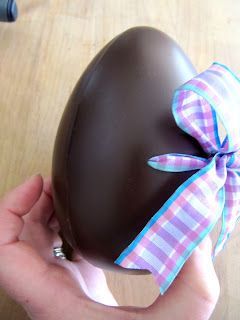 Brilliant idea ... that egg looks SO real! 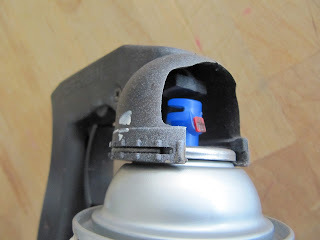 And I love the idea of the spray can nozzle - just what I need cause spray painting is a challenge for me. 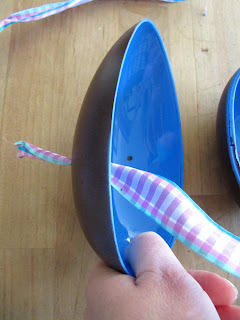 I've been avoiding buying the plastic Easter eggs cause we're trying to downsize and I don't need more 'stuff' but darn, there are so many nifty ideas out there for re-vamping them. 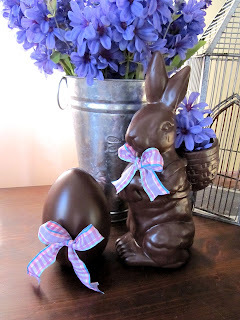 Your egg & bunny are so cute! they put them over their mouth. 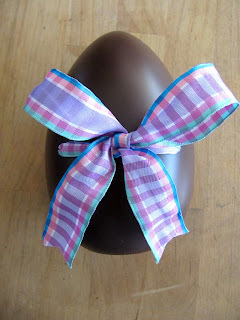 I love the look of the bunny and egg. Thanks for sharing. That's adorable and it DOES look like chocolate! Where can you find the spray attachment? This is a GREAT idea. 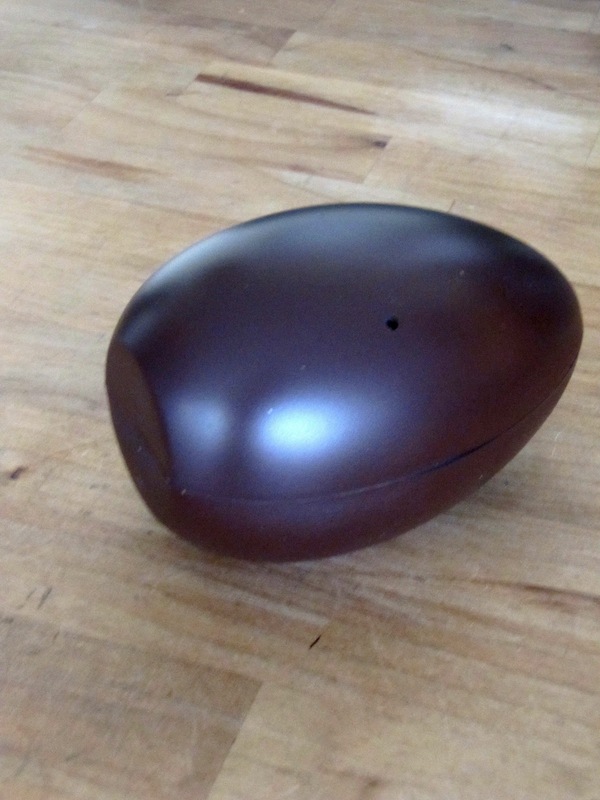 The chocolate colored ceramics in our area are very expensive. Thanks! Question about that paint - I have a horrible old tv cabinet I would like to paint. It is laminate and UGLY. 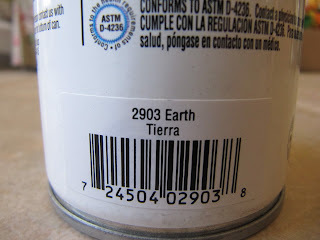 Will that type of paint stay on laminate? 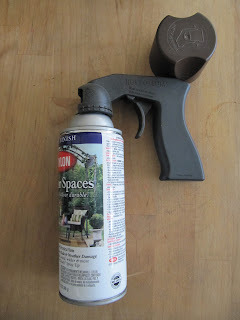 Fantastic idea, two thumbs up!...and you know i love my Krylon!! What a great idea! They look so real! I'm making my list and heading to the store! A little side story...when I was a kid my mom received a wooden carved bear that looked like chocolate...and why I had to try and bite it I'll never know..but I bit it's ear because it looked like chocolate. My mom is now 89 and still has that little bear with the bite taken out of it's ear! 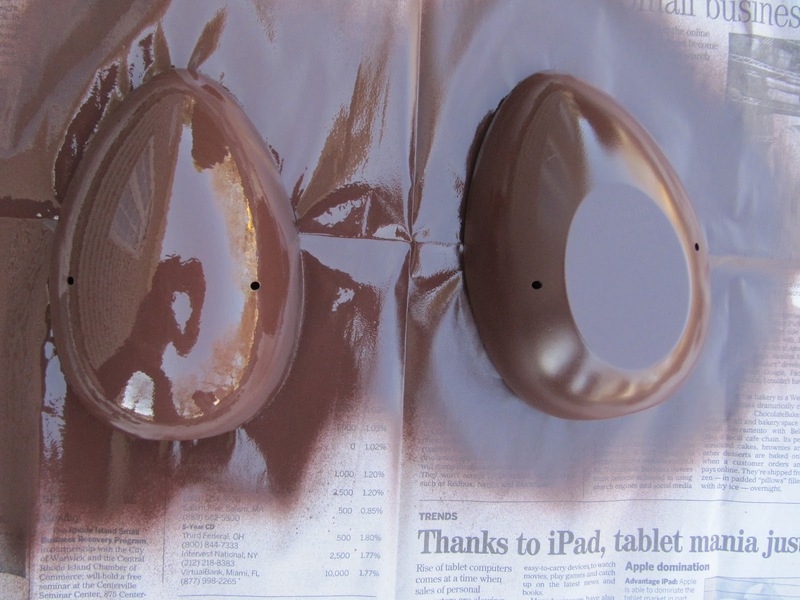 I have had my eye out for something to paint chocolate since I saw your bunny post. 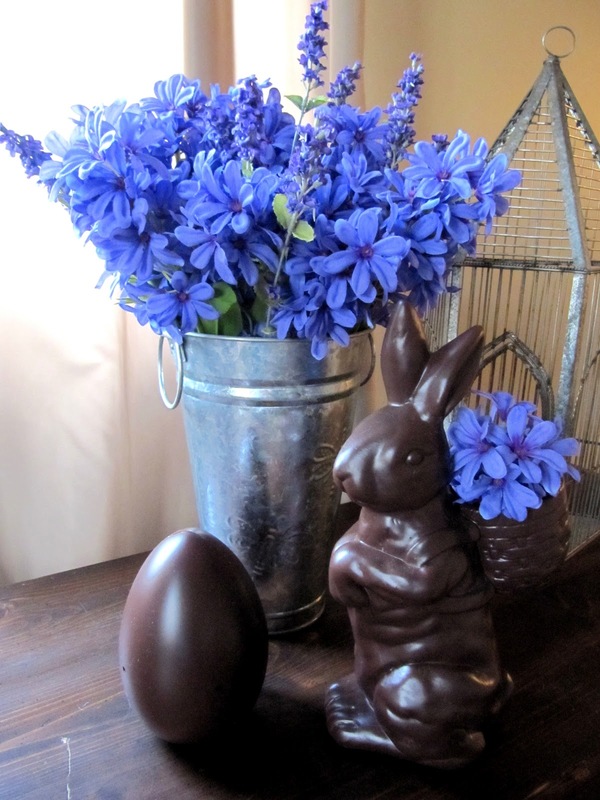 Chocolate makes everything better, even in decorating! Thanks. 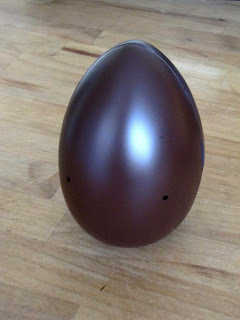 The egg looks good enough to eat and thanks for the tip on the spray can nozzle, I had no idea there was such a thing! Too stinkin' cute. Now Mr. Bunny has a yummy buddy. Such a GREAT idea! I'd love it if you shared this at a party that I have going on at Project Queen. I bought my eggs at Joann's yesterday at 60% off. I will buy the paint later and make my chocolate eggs for next year. Thanks for all of the wonderful ideas. If you would be willing to ship me one, I'd be happy to reimburse you for your troubles. Where in Walmart are the eggs?